We offer a Great Value for Money! complimentary minibar for softdrinks and water. Set in subtropical gardens overlooking the Atlantic Ocean, Belmond Reid's Palace has, for more than a century, been the ultimate place to stretch out in the sun and relax. Its subtropical gardens are internationally renowned, and now feature a spa tucked in among the trees. Over the years Reid’s has honed the art of pampering every single guest. Whether a young child or a centenarian, a fun-seeking teenager or a sports-mad 30-something, there are activities both within the hotel’s estate and beyond to keep you on the go year-round. Perched dramatically on the cliff edge above Funchal Bay, Belmond Reid’s Palace enjoys an unbeatable location. Situated 450 miles off the west coast of Africa and just 36 miles from top to bottom, this tiny semi-tropical Portuguese island is just north of the Canaries. It is blessed with a magnificent climate as well as rich culture, history and geology to make it one of the world’s most fascinating and beautiful destinations. From the position perched high on the cliffs above Funchal Bay, all Classic Rooms enjoy a partial sea view from the comfort of your private balcony. Rich, dark wood furniture, floral drapes and elegant cream linens add a warm welcome. Decorated in delicate pastel shades with antique-style furniture, our Superior Rooms ooze style and tranquility. Embrace the temperate climate of Madeira with an alfresco dinner for two on your balcony or private patio, overlooking the crystal-blue sea or the lush botanical gardens. The largest guest rooms, excluding suites, are situated in the most sought-after location affording unparalleled views of the sparkling ocean or the fabulous gardens. A king-size bed takes pride of place, tailor-made for an afternoon siesta as the sea breeze flutters through the picture windows. Experience the finest cuisine and exceptional service while sampling the stunning surrounds. Treat yourself to an unforgettable culinary journey at The Dining Room. This chic restaurant reflects the history and glamour of Belmond Reid’s Palace. Magnificent pillars and crystal chandeliers create a dazzlingly elegant décor. 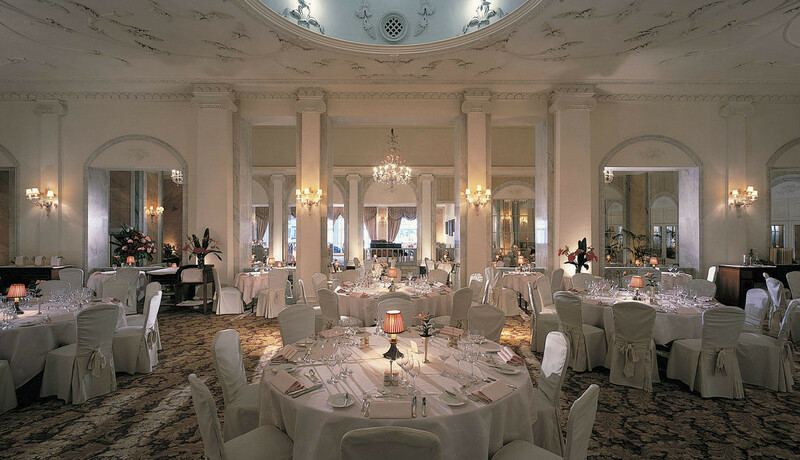 On Tuesdays, enjoy a stylish evening with the Dinner Dance. On Saturdays, indulge with a sparkling feast at the Champagne Gala Buffet. .
Villa Cipriani - As the name suggests, this restaurant offers a slice of Italian life on the edge of the Atlantic Ocean. This Italian restaurant features an open-air terrace and stunning sea views from the hotel’s hilltop location. Ristorante Villa Cipriani is an ideal spot for a memorable dining experience. Sip a mouth-watering Mojito or sample the local Madeira wine at the Belmond Reid’s Palace Cocktail Bar. It’s the perfect place for a stylish aperitif, or simply to wind down and plan your next adventure. Experience total rest and relaxation in the hands of the skilled spa therapists. With a soothing temperate climate, gentle sea breezes and secluded location, The Spa at Belmond Reid’s Palace is an oasis of tranquility. Inside you'll find a fine selection of treatments famed for their restorative powers. Each treatment room offers an ocean view and a private terrace. The indoor-outdoor therapy suite features its own private whirlpool. The spa uses world-class spa brands, namely Aromatherapy Associates, La Prairie, LaStone and Ytsara.